Alena Tkaova, Employability Assistant (Group support). The aim of this session was to focus on the use of social media accounts, currently run by Charlotte Paul and Stephanie Morgan in the placements team, to promote placements, keep in communication with students and highlight important messages. Feedback was required regarding the tone of the messaging, frequency, use of animations and GIFs, interactions with students and student perception of the effectiveness of the social media pages to engage students. Currently the platforms used by the placements teams are Facebook and Twitter. Students discussed whether there should be one platform, keep those in use or add others such as Instagram or Snapchat. The general consensus from students is that Facebook is the preferred platform, but that Twitter serves a useful support function. If the two platforms can be synced in their content and complement each other, then this warrants the use of both platforms. One group felt just having one platform and perfecting that could be better than maintaining two, but general consensus was that, to hit a majority demographic, Twitter and Facebook were the priority. Snapchat could add value to events, as could Instagram, but neither held much definite support to influence their implementation. LinkedIn was discussed as a professional alternative or addition to help students engage with employers and vacancies. It was noted by one group that not all students have Facebook and Twitter or social media and the Careers & Employability Service should have ‘reasonable expectations’ that students could ‘unlike’ pages or leave as followers when they leave the University, and that not everyone will want or expect to receive updates or information about placements through social media, meaning it was important that any important information was also given through formal platforms (DLE) to ensure non-users of social media were not missing out. Facebook maintained, with sync to Twitter. Critical information shored through formal platforms, with advice and highlights shared through social media (linked to topic 3 below). increasing engagement through timing and use of promotional tools. Prior to the focus group none of the students had heard of or engaged with the placements social media pages. Based on the group attendees, this is likely to be for a number of reasons: first year students, degree does not have placements and postgraduate students. However, all were interested in the running of the pages and felt that they provide a valuable service, particularly if they were to focus on shorter placements, volunteering and internships, rather than just industrial placements. All groups felt that to grow engagement sharing with other University of Plymouth social media accounts and find ways to collaborate with them to garner validation and support with a new audience would be beneficial. This could include faculty, central, student services, international and programme social media accounts as well as engagement with the Student Union. Students noted the popularity of the Student Jobs Twitter page and noted that they have engagement with other pages. Students felt that promotion in induction was not likely to be effective as there are so many messages, but as in other focus groups, including a ‘Follow-us’ promotion as part of a wider careers induction ‘Tool Kit’ would be useful for students as they could read through this in their own time. 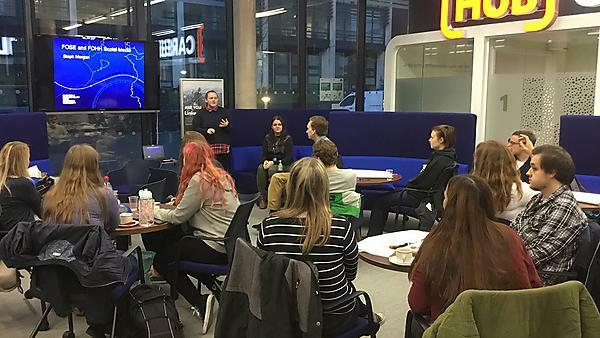 Again, as mentioned in other focus groups, having a student Careers Service Ambassador in each faculty could really help to promote the accounts and drive some student engagement/awareness. There was discussion of using algorithms to support work on interaction and engaging with #s at popular times, such as #mondaymotivation #devonhour #plymouthhour. Incentives, such as prizes and giveaways could also help engagement. Currently the placement engagement promotional materials are on credit card, laminated cards, which students felt may be expensive, and we could still use leaflets, but make cheaper, more readily available leaflets to give out in sessions and to store at key locations across campus. Email was a popular choice for promotion of the accounts. There was feeling from one group that certain schools can be ‘neglected’ when it comes to promotion and as this was a placement social media account, those who do not have placements are likely to miss out, even if the information about gaining experience is useful. smarter use of tools, such as time of day when posting, algorithms and #s.
Students felt that employer profiles, alumni case studies and current student placement experiences would make excellent content for placement social media platforms. Students felt that having an employer Q&A take over regularly on Twitter or Facebook would really help highlight their value and give students the ability to ask questions directly to an employer advertising a placement vacancy. This is used in product promotions or with celebrity interactions and always proves popular. If Facebook could profile an employer/student/alumni each month to promote an opportunity or an example of someone who has done/is doing well, through a placement this could really inspire students and add value to the platform, particularly if those students are sharing personal experiences of their time on placement. In this sense, Facebook live casts of interviews with students/alumni/employers could also attract engagement and prove to be useful service ‘on the move’. The use of GIFs and Memes was welcomed by students, as long as they were used appropriately as students saw this as familiar and light-hearted, and relatable. Consensus was that the ‘purpose of social media is light-hearted’ and within reason, this can help students feel encouraged to keep searching for a placement. The use of video on platforms was welcomes, particularly if they were short informational videos on the placement process, students and alumni sharing their experiences. Students welcomed a ‘meet the team’ video or banner, to learn more about who will support them in the placement process. One group felt happy to have the ‘sugar coating’ removed and wanted more realism about the work that goes in to finding and securing a placement. videos that share advice and instruction on the placement process and experience. Session one: where are the gaps?